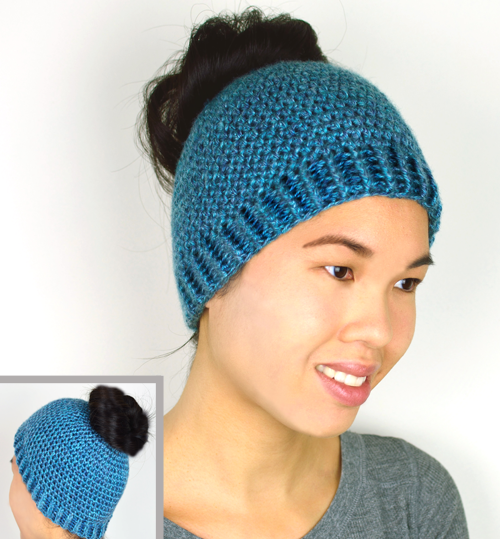 Now 30% OFF in the Crochet Spot Store, this hat is designed for the messy buns and the high ponytails. No need to squish your hair when you wear hats, let it stick out the top. Each hat size is crocheted with an elastic opening so that it stretches easily over the hair and doesn’t leave a large gap between hair and hat. A tutorial for crocheting with the elastic is included. This pattern comes in 5 sizes, ranging from baby (if they’re blessed with lots of hair!) to adults, so that everyone in the family can have one! Pattern is already marked down. There is no need for coupon codes. Log in, then add the pattern to your cart and check out. All purchases can be downloaded directly from your account once completed. Offer ends October 18, 2018. This entry was posted on Friday, October 12th, 2018 at 8:42 AM by Rachel Choi	and is filed under News. You can follow any responses to this entry through the RSS 2.0 feed. You can skip to the end and leave a response. Pinging is currently not allowed.